At 2:33 p.m. on the 26th, September 1997 an earthquake of magnitude 5.6 occurred, with the epicentre localized near the small village of Colfiorito, in the Italian province of Umbria. The first tremor was immediately followed by a swarm of weaker ones, distributed along a west - east segment of the Apennines. At 11:40 p.m. another high magnitude (5.8) earthquake occurred, with almost the same epicentre. The earthquake damaged heavily the historic buildings and the cultural heritage of the town of Assisi, and killed 11 people. Almost 30% of the ecclesiastical architecture was hit, in the basilica of San Francesco the ceiling was damaged. 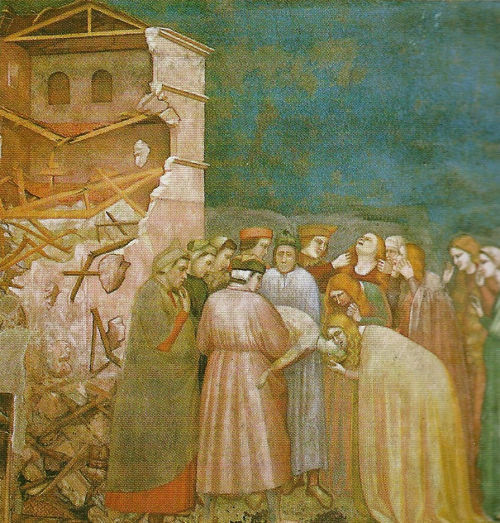 During a meeting to evaluate the damage caused by the first tremors a second shake caused the collapse of the roof, killing four persons and destroying the frescos. Fig.1. Fresco by Giotto (ca. 1.200) in the basilica of San Francesco, depicting a mother recovering the dead body of her daughter from a collapsed building. The tradition attributes the destruction to an earthquake, and tells also the miraculous reanimation of the dead daughter by the saint Franceso. These foreshocks were followed by an intense swarm of almost 8.000 weak (with a mean of magnitude 4) tremors in the following six months, many of them averted by the locals.